It isn't an ordinary homecoming, but Brad Kuhl isn't an ordinary ten-year-old. For nearly the past two years, he has been hospitalized for Attention Deficit Hyperactive Disorder (ADHD), Oppositional Defiance Disorder (ODD), and Conduct Disorder. Since June 1997, he has been admitted to at least ten institutions: from a treatment facility in Hutchinson to a half-way house in Crookston to hospitals in Thief River Falls and in the Twin Cities to a foster home. After having mixed success at facilities throughout the state, the county and his parents decided to bring him home to live full time again. The family will be getting considerable support. Two aides will be trained and they will spend days with Brad in the home. His parents, Gary and Kathy, will also get training, along with family members who want it. The homecoming efforts are being organized using the wrap-around process, which tries to build a base of support for the family using professional agencies. For the Kuhls, the wrap-around includes the family (parents, grandparents, and aunts); a county social worker, Paul Weinmann; their family doctor, Dr. Tom Sult; and their priest, Father Richard Leisen. The wrap-around committee meets every two weeks and is moderated by Janice Rein of Tri-County Action Programs (TriCAP). Brad currently resides in a crisis center near Brainerd, and stays with his family on weekend visits to Paynesville. He seems to be doing very well at the crisis center, but it is intended only for short-term stays. Potentially he could come home for good in May, but as long as the center has room no one is in a rush. "He got very good grades," said Kathy, of his six As and one C, "so I'd like him to stay until school is out." "(If) he keeps up with this and gets the behavior under control, he's going to go places," added Kathy. The Kuhls didn't realize Brad had a medical condition until their younger daughter, Heidi, now eight, had health problems that required in-home therapy for eight weeks. "We thought he was just an active toddler, but a professional picked it up," said Kathy. "He just didn't seem like a normal active kid of that age," added Gary. "He was very high strung." To be officially diagnosed with Attention Deficit Disorder (ADD), at least six symptoms need to be identified. For a diagnosis of ADHD, an additional six symptoms relating to hyperactivity must also be present. "Kids with ADD or ADHD are extremely aware of their surroundings and can focus intense interest on what interests them," explained Dr. Tom Sult, M.D., Brad's physician. In paying attention to their surroundings, Sult said, such a child could turn all the attention of their senses to a dropped pencil and miss what their teacher is saying. Oppositional Defiance Disorder means what it says: being defiant, always choosing the opposite. "When you place that with hyperactivity," said Dr. Sult, "he's being oppositional and defiant at warp speed." Conduct Disorder means he can resort to rather drastic actions when he doesn't get his way. It's not polite opposition; it's tearing wallpaper from the walls and worse. "He was able to knock the wind out of me when he was seven," said Kathy. Having difficulty with authority and with getting along with others didn't bode well for Brad when he started school. "He could have a good day. He could have a bad day," explained Kathy. "There was no happy medium." As he got older his condition progressively worsened. "In third grade it came to a head," said Kathy. "He'd assault teachers, students, his mother." By then he had been taken out of a regular classroom, and he was suspended from school a number of times. Outside of school he would do things like shoplift in the downtown stores. His parents would turn him in, but "it didn't mean anything to Brad," said Gary. Around Christmas 1996, Kathy promised Brad to go downtown, but their car wouldn't start. That caused a rage. "All because of 'no.' All it took was a 'no' and this kid flipped out," she said. At home one morning when he was six, Brad directed inappropriate language at his mother, and his father slapped his face. Before Kathy and Gary thought anything of it, the matter had been reported at school and to the police and Gary was charged with abuse. They didn't deny it, and Gary took a mandated parenting class. "It was the best class I've ever taken," said Gary. "I highly recommend it to anyone who is a first time father." After that incident, the Kuhls had an even harder time defending themselves against the charge of "bad" parenting, which is a common assumption for kids with ADD and ADHD. "People didn't know of this before, so they assumed it was bad parenting," said Gary. While seeking help for Brad, Kathy was told once to "grow up and be a parent." Other insults weren't as obvious, maybe just a condescending look. "If it was really as simple as 'bad' parenting, then why do they have one 'bad' kid?" asked Dr. Sult. Heidi is a typical second grader. According to Dr. Sult and Donna Bahr, a doctor of psychology who is the director of psychology at the Paynesville Area Health Care System, research shows that the brains of people with ADD and ADHD don't function the same physically. "If you have a biochemical imbalance," said Dr. Sult, "your behavior is no more controllable than cancer." "Parents get blamed and kids get blamed for things that they have no control," explained Dr. Bahr. "If your brain is not working right, you have no control," she continued. "If you have some other mallady, you don't get labeled." Having a child with ADHD eliminates most of the margin for error that other parents enjoy. You pay for mistakes more frequently and more severely. "A kid that doesn't have ADD is going to be much easier to manage," explained Dr. Sult. Having a child with ADHD, ODD and Conduct Disorder, he said, "is like the most difficult parenting situation anyone can imagine." 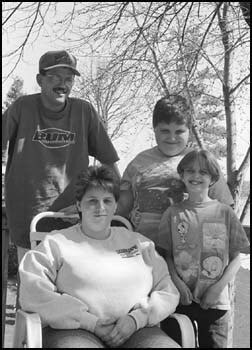 In June of 1997, Brad was admitted to the McLeod County Treatment Facility in Hutchinson. The facility is licensed to use holding techniques. "The first month he was held 33 times," said Gary. After six months of minimal progress, and regular weekend visits from his family, Gary and Kathy tried a ruse with the staff. "You don't want your family anymore," the officials told Brad, according to Kathy. "They're gone." "It was the hardest thing Kathy and I have ever done," said Gary. They left crying; Brad showed no reaction. For six weeks, they made no phone calls, they wrote no letters, and they paid no visits to Hutchinson. They had no contact with their son. It didn't work. Brad knew they'd come back eventually. After that, he left that treatment facility and started his tour of facilities throughout Minnesota. Sometimes he stayed for a month; sometimes for just a couple weeks. "We visited him as much as possible," said Kathy. "We called him all the time." Frequently he'd have a confrontation and for safety reasons he'd be forced to leave. There were other reasons, too. Hospitals frequently have time limits for stays, and when the time was up, Brad moved on. Gary and Kathy became rather cynical by the great speeches at admittance time followed by a quick relocation. "They all said they weren't going to give up on this kid, but then they all did," said Kathy. "The idea that the parents should be able to handle him when the 'experts' couldn't is ridiculous," said Dr. Sult. Arranging these facilities was never an easy job, and after trying ten in the state the alternatives were becoming fewer and fewer. "All of a sudden he's cured because there's no place else to send him," Kathy said. So with professional support, Brad will be moving home within the next few months. "They're hoping it will work. We've got to do something," said Kathy. "It's not going to be easy all the time." He comes home on most weekends already. Right now, coming home is a reward. "I love it," Brad said a couple weekends ago. At his school, good behavior is rewarded with points, which are used to buy treats at the canteen and to have a special lunch on Friday. Good behavior also allows Brad to visit the library on Fridays. "I've earned 99 before," Brad explained excitedly. "You can earn over 100." Marks are given for bad behavior, like inappropriate commments, using the naughty finger, and going to the time-out room. "There's been progress. Not as much as we would like, but he's come a long way from his throwing-things-across-the-room days," said Kathy. How to attribute the progress is harder. Part of it is a new medication, that while causing Brad to gain weight has mellowed him considerably. Another key factor is simply age. "It's hard to know how much he's improved and how much he's just gotten older," said Dr. Sult. With age comes more rationality, and a better understanding of the consequences of actions. It was obvious that Brad understood the rules of his new school when he listed off the rewards and punishments. ADD and ADHD is not linked with intelligence. "Brad is flat smart," said Dr. Sult. "He reads people very well. He understands if you're genuine in a heartbeat." There's a big difference, though, between visiting and living full time. The Kuhls know that relations with Brad will not be easy all the time when coming home isn't a reward because he lives here for good. "We're going to get to be routine pretty soon," said Kathy. That's fine most of the time. Like other kids his age, Brad likes watching movies, playing with toy cars, and playing games with his sister and parents. "He's a fun-loving kid," said Kathy. "When he's having a good day he's cheerful and laughing." "He's got a very good sense of humor," added Gary. "He can be the perfect gentleman when he wants to be," explained Kathy. But trials await, too. "He hasn't lashed out yet," Kathy said, "but you have to be prepared." "It's going to take community involvement to make this work," said Gary. "Unfortunately, Brad's long-term prognosis is very poor," said Dr. Sult. "Without successful support and intervention at home and in the community, he is destined to bump against authority and lose." Dr. Sult and Dr. Bahr suggested three things the community can do to help ADD and ADHD patients, including Brad. The first is to become less arrogant in assumptions about the situation, to not automatically assume that it is "bad" kid with "bad" parents, to be more understanding of the medical condition. Secondly, said Dr. Sult, you can offer hope, prayers, and support. The last way is to get involved, with a specific child if you know one or in youth activities in general. In addition to athletics, there are the Boy Scouts, the Girl Scouts, the Trail Guards, the Big Brother and Big Sister programs, and more opportunities on an informal level. ADD and ADHD kids often do well in less structured settings. By getting involved, you can help the child stay active and form a needed friendship for him or her. The parent will no doubt be grateful for the break from supervision. "Parents need a lot of support," said Dr. Bahr. "It's a very trying problem in the family and affects everyone." In fact, a support group was started three years ago for parents with children with ADD, ADHD, and other emotional disorders, and one of its primary functions was to be a break for parents. It also is an opportunity to share experiences, have an outlet for relief, and talk about resources available to help.